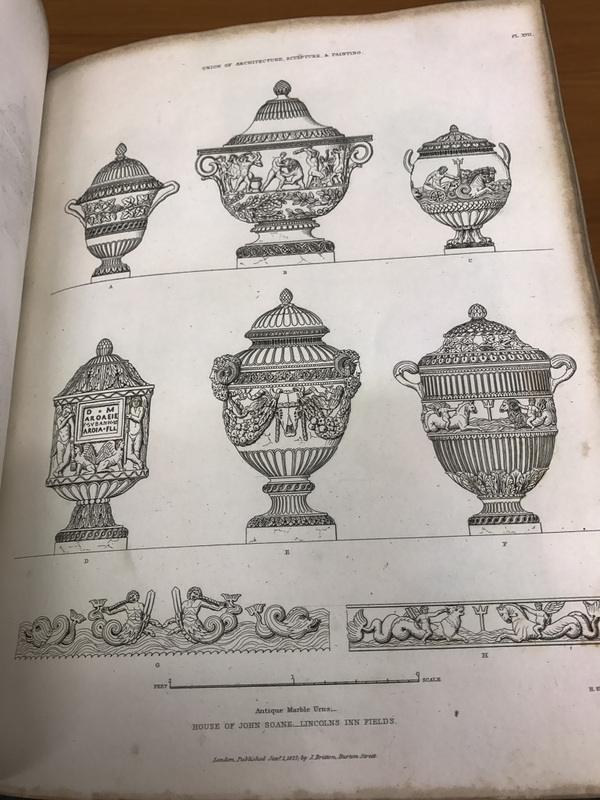 The antiquarian John Britton (1771-1857) and the neo-classical architect Sir John Soane (1753-1837) shared a strong belief that objects in all its kinds and forms were an essential part of one’s education. 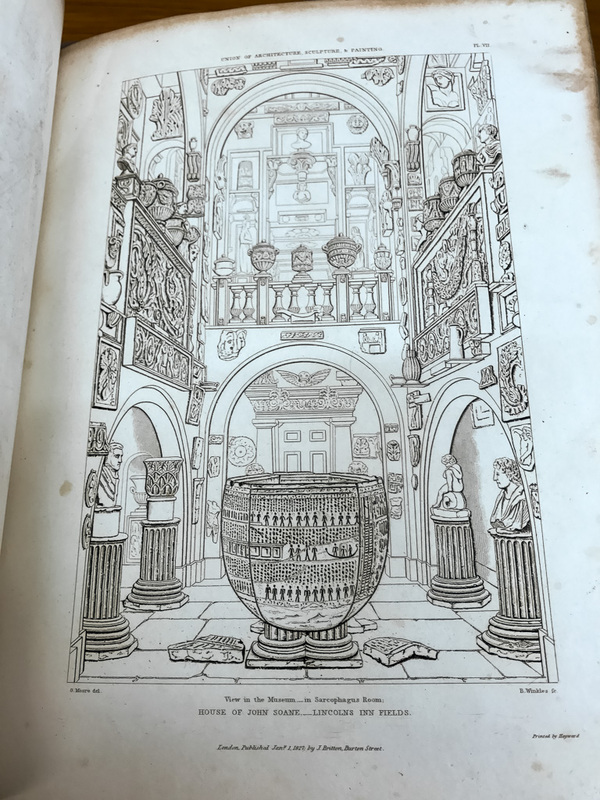 Their fascination with objects is manifested in Britton’s book The Union of Architecture, Sculpture and Painting of 1827, which was the first guidebook to Soane’s house-museum at Lincoln’s Inn Fields in London, today known as Sir John Soane’s Museum. The book is divided into two different sections: a written introduction by John Britton and a collection of architectural drawings and engravings of Lincoln’s Inn Fields. With the book, Britton aims to comprehensively articulate and re-create Soane’s architectural concepts and vision, as exemplified in Lincoln’s Inn Fields, in order to demonstrate his wisdom and genius as an architect and collector. In the Gallery Offices in Lincoln’s Fields, Britton employs realistic eye-level and diagrammatic aerial views as two main methods of representing three-dimensional space on a two-dimensional surface. 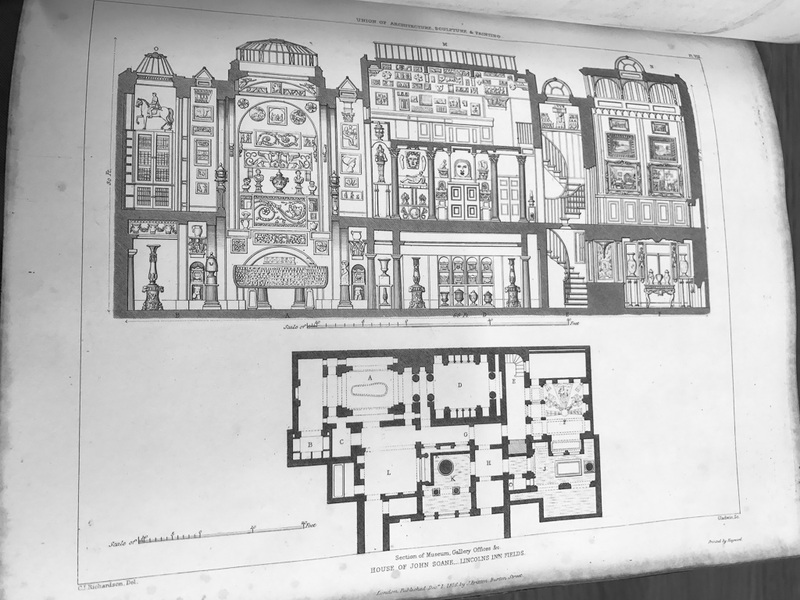 The architectural drawing on the top of the page is an eye-level section drawing, which depicts both the exterior frame and the interior of the building, including realistic frontal representations of the key artefacts. This cross-section helps emphasise the way in which Soane has connected the three townhouses by defining the walls and levels of the external structure. The “realistic” representation is characterised by its depiction of accurate proportions and an awareness of three-dimensional volume through light and shade. This stands in contrast with the floor plan just below, which employs a different representational technique and viewpoint. The aerial depiction of the structure relies on a more diagrammatic method of representing three-dimensional space, which is reinforced by the legend, reflecting the actual measurements of the house. However, this diagrammatic method differs from that of the cross-section insofar as it requires a learned understanding of architectural representational conventions. Working in tandem, both the section drawing and the bird’s eye ground plan contribute to the viewer’s understanding of the spatial relations between the whole external structure with individual internal spaces. The importance of understanding the wider spatial arrangement resurfaces in the floor plan of the Sarcophagus Room with laid-out wall elevations. This illustration combines the diagrammatic, aerial method of the floorplan with laid-out elevated drawings of the interior wall decorations to achieve a clearer expression of the sarcophagus’ relation to its surroundings while also making the artefacts visible. As such, the priority of this method of representation is not for an understanding of the three-dimensional depth but rather, for a clearer concept of Soane’s spatial and thematic organisation. Having established the position of the sarcophagus in relation to the other rooms of the house, the engraving View in the Museum, the Sarcophagus Room presents a specific and controlled east-side view of the Sepulchral Chamber. From this position, the alabaster sarcophagus of the Egyptian King Seti I of the XIX Dynasty is presented frontally and foreshortened. The engraver articulates the sense of distance between the objects by using shallower incisions to create fainter lines. As suggested, the fainter the line, the further away the objects are located from our position. As we are only presented with a limited view of the sarcophagus, its surrounding environment is suggested to be equally as important. This is reinforced by the position of the Romanesque arches whose forms are echoed, in particular, in the bottom and top arches. This leads our attention up towards the dome area, where Soane’s rich collection of casts, vases, cinerary urns, paintings and sculptures dominate the interior space. Perspective View of the Museum re-depicts the dome area introduced in the previous illustration, but from a different perspective that arguably offers a clearer view of the objects on display. The illustration employs the same techniques of representing three-dimensional space, as in the above-mentioned engraving, through the proportionally receding lines of the flooring that both emphasize the sense of spatial depth and direct the reader off towards the fictional space of the adjoining rooms. This technique helps us establish an awareness of each illustration’s spatial relations to the whole of the building through the way some indicate to rooms and spaces beyond the boundaries of its composition. The illustration Antique Marble Urns presents a detailed representation of the individual marble urns. 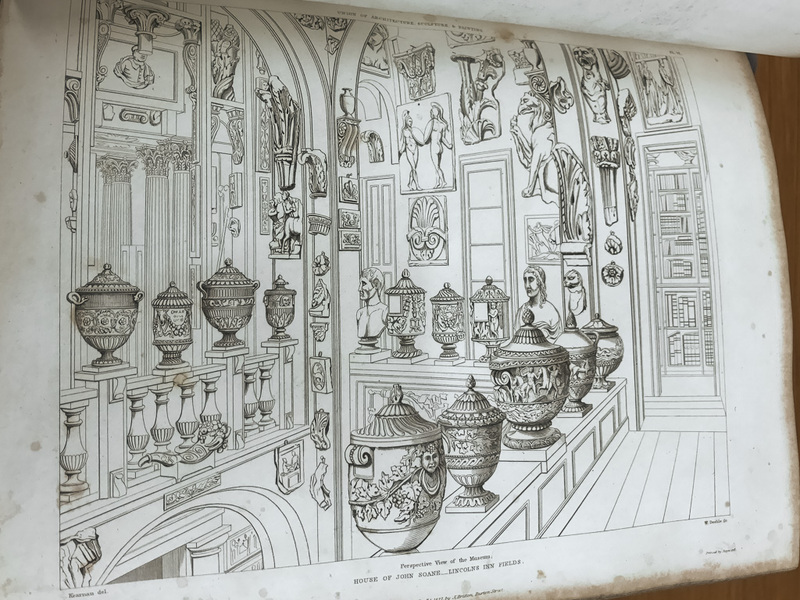 In contrast to the previously discussed illustrations, this engraving displaces the objects of focus from their contextual environment to encourage a more concentrated engagement with details of the carvings themselves. Despite being presented floating in a grid-like arrangement that flouts understandings of realistic space, the urns themselves are depicted realistically, with shadows indicating both their volume and the physicality of their carvings. However, below the urns, two bands of carvings have been isolated from their context and further magnified and flattened on the page. By presenting the carvings in two different sizes, one on the urn, and the other magnified and isolated from the urn, the legend then serves to remedy this disparity by clarifying its actual three-dimensional size of the page. As previously discussed, the legend plays a key role in reminding us of another form of representation, which communicates three-dimensional space through a system that assumes the viewer’s understanding of such diagrammatic visual conventions. The various illustrations discussed reflect the wide range of representative and illustrative conventions that have enabled each to effectively communicate three-dimensional space on a two-dimensional surface. 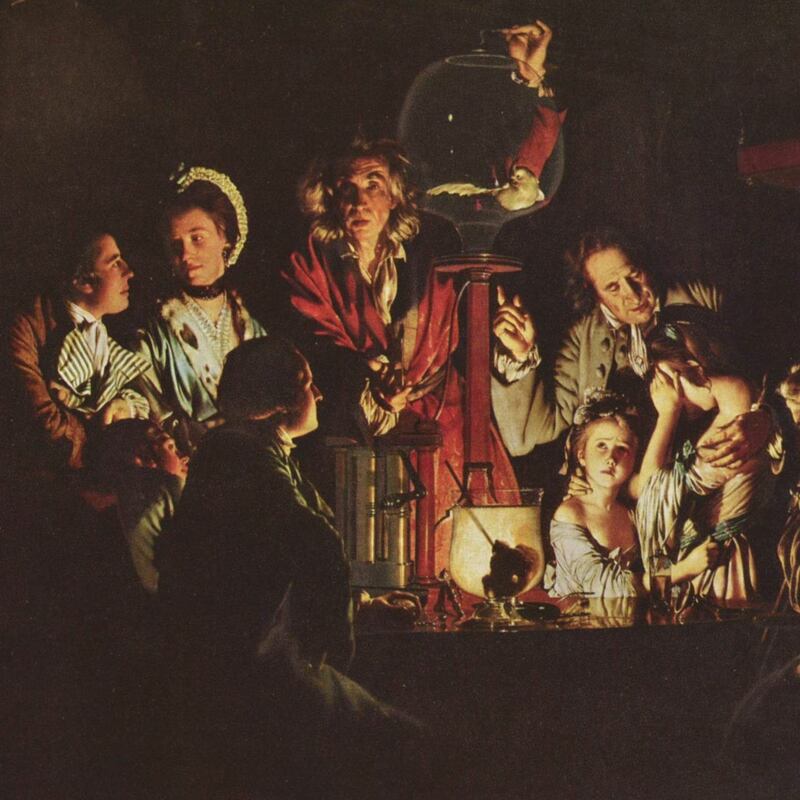 As our discussion suggests, each representational technique serves to communicate a different type of information, and only through an amalgamation of these multiple types of information can we arrive at a comprehensive and cohesive understanding of the three-dimensional space of Soane’s house-museum. 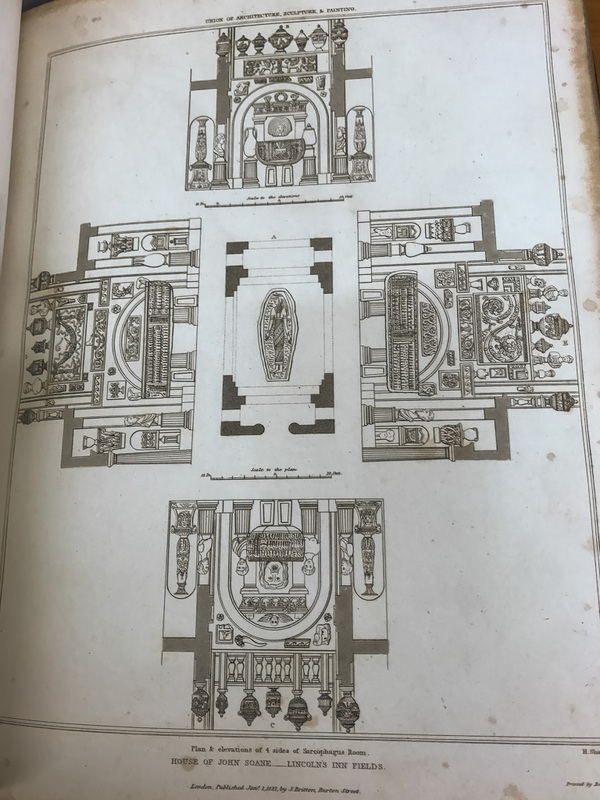 The effectiveness of these illustrations can ultimately be seen as contributing to Britton’s wider aim of establishing and glorifying Soane’s originality as an architect and collector as well as illustrating Lincoln’s Inn Field’s success as a unity of architecture, sculpture and painting. Dean, Ptolemy. Sir John Soane and London. Aldershot: Lund Humphries, 2006. Feinberg, Susan G. ‘The Genesis of Sir John Soane's Museum Idea: 1801-1810’. Journal of the Society of Architectural Historians 43, no. 3 (October 1984): 225-37. Jackson, Anthony. ‘The Façade of Sir John Soane's Museum: A Study in Contextualism’. Journal of the Society of Architectural Historians 51, no. 4 (December 1992): 417-29. Richardson, Margaret and Mary Anne Stevens. John Soane: Architect: Master of Space and Light, Royal Academy Publications, 2015. Watson, David (ed.). Sir John Soane: The Royal Academy Lectures. Cambridge; New York: Cambridge University Press, 2000. Fully digitized copy of Britton’s The Union of Architecture, Sculpture and Painting (1827) is available here.